Volunteers are crucial to the success of Canine Companions. We rely on their enthusiastic participation in countless ways including fundraising, special events, campus tours, and administrative assistance. If you are interested in any of these opportunities, please complete the volunteer application. If you are a current volunteer, you can view a summary of available volunteer opportunities. To sign up for open positions and post your volunteer hours, log in to the volunteer information center. Volunteer orientation must be completed by all volunteers (puppy raiser/sitter/foster orientations are separate). Mark your calendars to attend one of the following volunteer orientations. If you would like to volunteer, please complete the volunteer application. We are very fortunate to receive many inquiries from businesses, organizations and schools interested in community service. 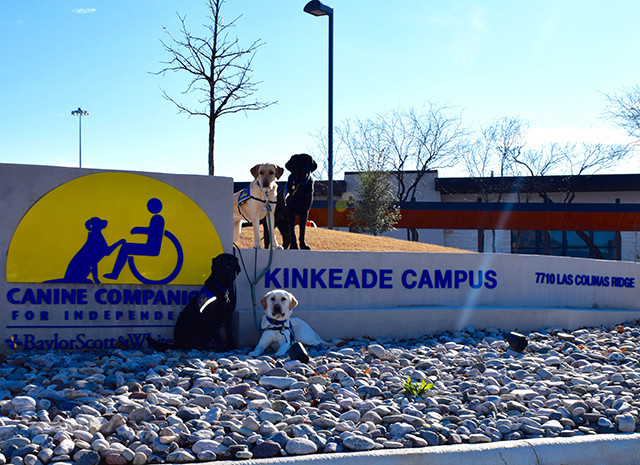 We are grateful that you want your community service hours to benefit Canine Companions for Independence. Organize a small fundraising event such as a bake sale, car wash, lemonade stand, etc. and donate the funds to Canine Companions. Create a DogFest team and raise funds for your local DogFest event. Visit www.cci.org/dogfestdfw for more information. Become an expert! Learn about Canine Companions and help to spread the word to local schools, service organizations, and other community groups. Please contact the volunteer coordinator to have your project approved prior to starting. Be sure to document the time you spend working on your project. When the project is completed, contact the volunteer coordinator to make an appointment and at that time you will receive a sign off on your completed hours.